When replacing your number plate you should make sure that the correct material has been used to manufacture the plate. It should be made from a reflective material. Front number plates must display black characters on a white background and rear number plate must display black characters on a yellow background. The Driver and Vehicle Licensing Agency is not aware of any self-adhesive number plates that meet the British Standard requirements. Characters on a number plate can be 3D, providing they meet all the other requirements, but honeycomb or other background patterns are not allowed. Also, the characters on a number plate need to be a standard height and width. Motorcycles registered from 1 September 2001 must only display a number plate at the rear of the vehicle. Motorcycles registered before 1 September 2001 can display a number plate at the front, but do not have to. 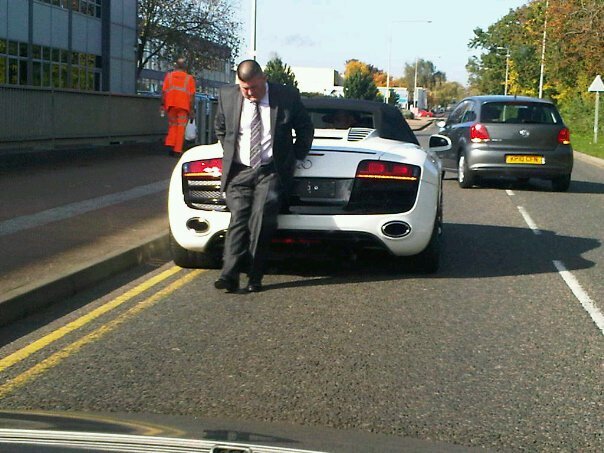 The number plate must be a ‘two-line’ number plate. Tricycles made from motorcycles must meet the number plate requirements for motorcycles. Tricycles made from four-wheeled vehicles, such as saloon cars and quad bikes must meet the same number plate requirements as all other vehicles. To have a number plate made for your vehicle, you’ll need to go to a registered number plate supplier (RNPS). The registered supplier will need proof of your identity, as well as proof that the registration number belongs to you. Vehicle registration numbers are a way of identifying vehicles. The current vehicle registration number format was introduced on 1 September 2001 for all new vehicles being registered. The first two letters (the local memory tag) tell you the office where the vehicle registration number was first issued, the two numbers are the age identifier, and the last three letters are random. 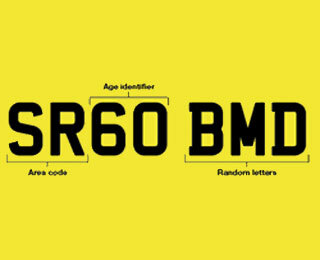 Example: SR signifies Dundee, 60 represents September 2010 and BMD are random letters. The age identifier changes every six months, once in March and once in September. NB: This article is summarised in bullet points at the foot of the page. When the new registration format was introduced in 2001, regulations governing the construction and display of car number plates were revised. These revised regulations apply to the number plates on any and all vehicles registered on or after 1st September 2001. 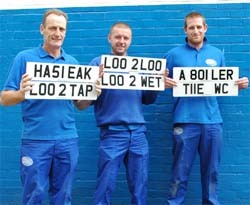 They also apply to all replacement plates made and mounted on vehicles on or after the same date. Number plates must now use one specific, mandatory typeface – a very simple sans serif typeface intended to make the numbers easy to read by both humans and automatic recognition systems, which are increasingly being used by the police and other agencies. All hard-to-read variants, such as multiple stroke and italic fonts, are now prohibited. The one decorative variation still permitted is a 3D effect version of the mandatory typeface. Optionally, number plates may display one of the following national emblems: British Union Flag with “GB”, English Flag (St George Cross) with “ENG”, Scottish Flag (St Andrew Cross) with “SCO”, Welsh Flag (red dragon on green/white field) with “Wales” and “Cymru” or Euro Flag (circle of stars) with “GB”. If the Euro/GB configuration is displayed, then the bearer vehicle need not display a separate “GB” emblem when driving within the EU. The colours and reflectivity of number plates are also specified in the regulations, and there is a British Standard (BS AU 145d) which describes the physical characteristics of number plates, including: visibility, strength and reflectivity. Front plates must have black characters on a white background, while rear plates must have black characters on a yellow background. 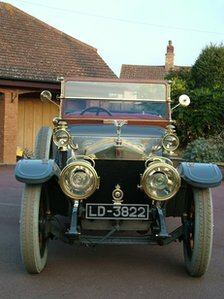 The British Standard also requires that a number plate must be marked with the following information: the British Standard Number, the name, trade mark, or other means of identification of the manufacturer or component supplier, the name and postcode of the supplying outlet. A non-reflective border is optional. 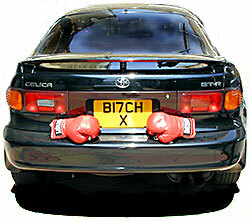 There may be no other markings or material contained on the number plate. •National emblem: English St George Cross with “ENG” legend, Scottish St Andrew Cross with “SCO” legend, Welsh Dragon with “WALES” and “CYMRU” legend, British Union Flag with “GB” legend) or Euro Stars symbol with “GB” legend. •Additional logos or symbols, such as sporting emblems and religious symbols. There are concessions for older and vintage cars. 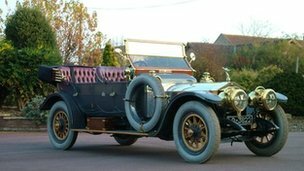 “Historic vehicles”, i.e. those built prior to 1973, are permitted to bear the old-style black plates of either plastic or traditional metal construction.